So anyone who isn’t either a producer, an engineer or married to one, may not quite understand that basically our whole lives revolve around the pursuit of gear that will make our recordings better. The acquisition of such a piece represents a major milestone in our earthly journey. You may think that the most memorable moments would be the birth of our first child or our wedding day. And while those sorts of occasions are indeed jolly interesting, there’s not much point in getting too caught up in them because we have a wife or girlfriend, husband or boyfriend who’s going to do quite enough of that for both of us. At the time we may look like we’re so chuffed that even a lifetime supply of Dr Sphincter’s Amber Enema couldn’t make us happier, but the fact is that we’re thinking about acquiring (usually vintage) music gear. It might be Neve preamps, Pultec equalisers, or UREI compressors; or it could be Gibson guitars, Marshall amps or a particularly nice Steinway piano that we’ve heard about. But the fact is that we’re far more preoccupied with these things than with what hymns were sung at our wedding, or what little Johnny or Jenny may or may not have said for her first word (even though everyone knows that ‘baaa’ isn’t a word). So where does this leave us? Well, not rich, that’s for sure. And also with a general fear of shared finances, joint bank accounts and ‘financial planners’. In fact, just recently I had a conversation with my accountant in which she asked me when I would be finished buying equipment. I was forced to repress my (quite understandable and not inconsiderable) scorn at this fatuous remark in order to maintain the general bonhomie, but frankly her days are now marked with numbers as low as my credit rating. So where is this going? Well it gives me, if no-one else, the great pleasure to tell you that today is one of those days that gives my life that extra little bit of meaning. 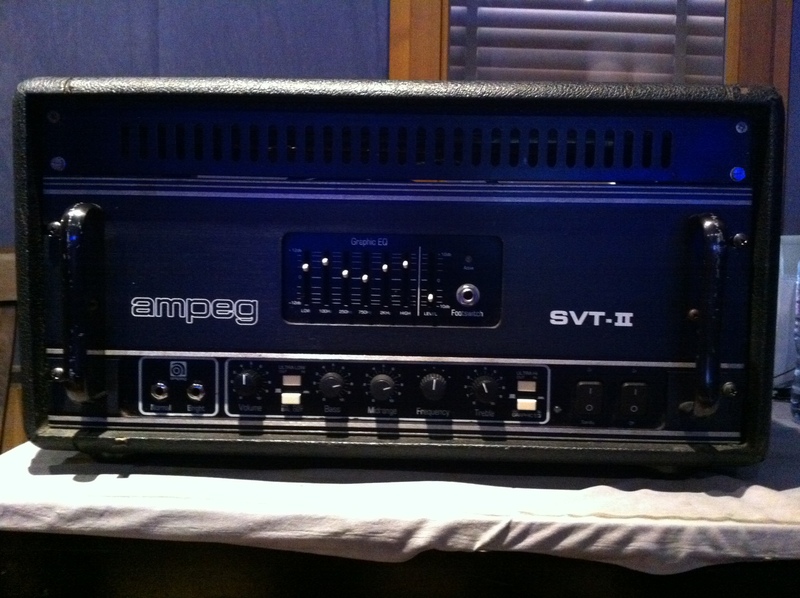 I’ve bought an Ampeg SVT II. An SVT II is an older, American made Ampeg head which sounds pretty much like a classic SVT, but with a little bit more guts (if possible). It’s a worthy addition to the collection and will do great things for our aggressive rock bass sounds. I had one to sell !! !